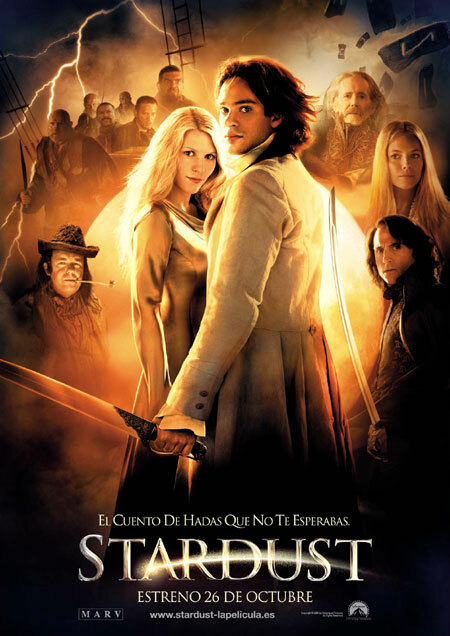 STARDUST (2007); Dir: Matthew Vaughn; Based on the illustrated book by Neil Gaiman and Charles Vess; Starring Charlie Cox, Claire Danes, Sienna Miller, Ian McKellen, Michelle Pfeiffer, Robert De Niro ; Mythic Movies Series presented by the Mythic Imagination Institute and prologue to Faerie Escape Atlanta convention at the Plaza Theatre, Thurs. 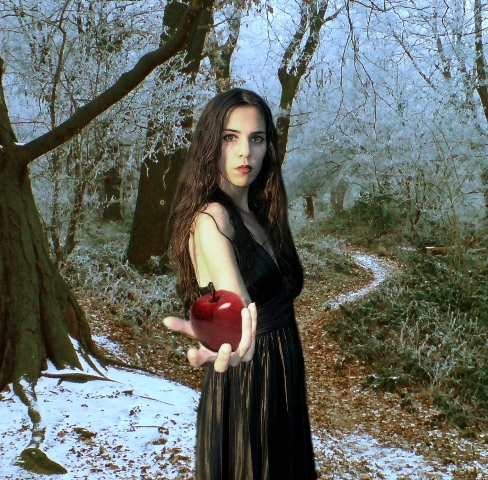 June 14; 7:30 PM; Discussion following led by Lisa Stock (SNOW, GLASS, APPLES); $10; trailer here. Short Version: A philosopher once asked, “Are we human because we gaze at the stars, or do we gaze at them because we are human?” Pointless, really… “Do the stars gaze back?” Now *that’s* a question. Medium Version: THE PRINCESS BRIDE (1987) for a new generation. The Village of Wall stands between the world of Fae and our own. One day a star falls, and a capricious girl Victoria (Sienna Miller) sends a young man named Tristan (Charlie Cox) on a quest to bring it to her. So he does. And in the process finds everything he never knew he wanted, for while on our side of the wall, a star is a ball of super-heated gases, on the other side of the wall, the star is a beautiful girl Yvaine (Claire Danes), who is not so keen on being brought back across the wall. Maximum Verbosity: What is a mythic movie? One might as well ask “what is a myth?” – for which one can consult a dictionary at any time. But the short version is that a myth is a story that works itself into our collective unconsciousness, that tells of a society (including our society) and becomes a part of who we are. In this postmodern world, the myths of many cultures work our way into the American melting pot. Why else would a Greek God like Zeus still be known to every man, woman and child of a civilization that is thousands of miles away from Greece and only claims a small population descended from that region? 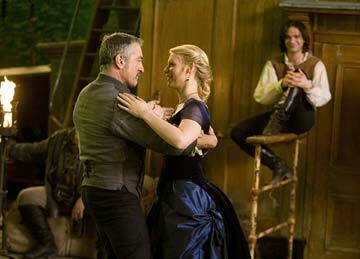 Airship Captain Shakespeare (Robert De Niro) dances with star Yvaine (Claire Danes) in STARDUST. Paramount Pictures, 2007. The stories themselves have taken on a timeless quality and teach lessons that we learn and incorporate into our lives, very often without even knowing it. 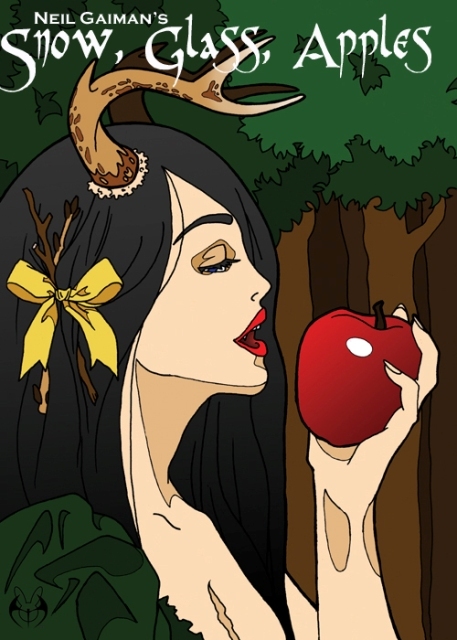 Fairy tales have been quite popular of late, and there is a reason for it. Most all of us learned about them growing up. But not all fairy tales come from the Brothers Grimm. Around the turn of the century, a series of fairy tale collections gathered by Andrew Lang based on color, THE RED FAIRY BOOK or THE GREEN FAIRY BOOK, graced many bookshelves around the world and were based on a world of Fae very different than the mildly mischievous Tinkerbell who makes the children fly in Disney’s PETER PAN. These Fae are beautiful, dangerous, insane, alien and haunting. STARDUST is a tale inspired by these kinds of tales and does so with such perfect mimicry that it might as well be one. It has all of the class elements of the fairy tale, of course, including witches, magic spells, a crown to be won, romance, a heroes’ quest and unbearable loss. But it carries with it the innovation and freshness that modern fantasy diaspora provides – a world that makes sense in Fae with a ship that catches lightning and magic that acts much like science does here. Neil Gaiman (the author of the illustrated book upon which the movie is based) is an excellent writer, but the reason he enjoys such popularity is because his tales capture the epic feel of ancient myth with modern language in a way that makes them as meaningful to us today emotionally and creatively, as the older mythic stories were for the original people who were awed and inspired by them in the first place. On the surface, STARDUST is simply a fun movie. It just wasn’t marketed very well, but it has a slow, small cult following that grows a little bit each year. The characters are very human, and you find yourself rooting for our hero Tristan, especially since at one point or another, we have all done something stupid to impress a girl (or, in reversed circumstances, a guy). But stupid though his task may be, he is bound and determined to do so. He is not only in love, and to a lesser degree his personal honor is at stake, but as he finds the star, alone and so far from her sisters, shining in the heavens above, he begins to have a change of heart. And a change of heart is what all great love stories are about. Lamia (Michelle Pfeiffer) in STARDUST. Paramount Pictures, 2007. On a deeper level, of course, all kinds of things are going on. The true value of sibling love, or rather the lack thereof is often manifest, and the mistakes of our predecessors are often echoed again and again. We often do incredibly stupid things because that is simply the way we have done them. There is the treachery of power, and how, once tasted, we will do almost anything, no matter how vile to retain it. And how of the many flavors of power, physical attractiveness is the most fleeting and superficial powers of them all. STARDUST is a story of what being beautiful truly means, a coming of age tale, and also deciding what it really means to be who you want to be. And all of that is what makes STARDUST not only a “mythic movie” but an excellent one, for it teaches on many levels. Jim Henson (DARK CRYSTAL, LABYRINTH) also was a master of this. He entertained children, but also entertained the adults at the same time with jokes that only they got. Gaiman tells an exciting story, but weaves in lessons as timeless as the stars they honor, and you enjoy letting him do it. I cannot recommend this movie enough. It is fantastic in every conceivable way, and this Thursday at the Plaza Theatre, you will get a very rare opportunity indeed: to see it in a historic art-deco (REAL) cinema with an appreciative crowd. The odds of you wanting to own the DVD after seeing it are very high. See the movie.